See also: Leslie Noelani Laurio's Definition of CM in 100 Words, and 600 Words. Charlotte Mason was a British educator who believed that education was about more than training for a job, passing an exam, or getting into the right college. She said education was an atmosphere, a discipline, and a life; it was about finding out who we were and how we fit into the world of human beings and into the universe God created. But this kind of thinking was pretty much eclipsed during the 20th century by demands for more exams and more workers. In 1987, Susan Schaeffer Macaulay wrote a book called For the Children's Sake, which reintroduced parents to Charlotte Mason's methods and philosophy, and it started to gain a foothold with a new generation of homeschoolers. Charlotte Mason believed that children are able to deal with ideas and knowledge, that they are not blank slates or empty sacks to be filled with information. She thought children should do the work of dealing with ideas and knowledge, rather than the teacher acting as a middle man, dispensing filtered knowledge. A Charlotte Mason education includes first-hand exposure to great and noble ideas through books in each school subject, and through art, music and poetry. The knowledge of God, as found in the Bible, is the primary knowledge and the most important. History is taught chronologically, using well-written history books, source documents and biographies. Literature is taught along with history, using books from or about the same time period. Language arts skills are learned through narration, which consists of the child telling back a story, first orally and later in written form; copywork, or the transcribing of a well-written piece of literature; and dictation of passages from their books. Memorization was used by Charlotte Mason not so much to assimilate facts, but to give children material to meditate or "chew" on, so her students memorized scripture and poetry. Science in the early years emphasizes nature study with an emphasis on close, focused observation of creation as a means to knowledge of God. Charlotte Mason was very excited about science. She felt that all the new things people were discovering in her lifetime were part of God's revelation, including the theory of evolution which was accepted by many Christians at the time. Christians using her methods now can still identify with her emphasis on nurturing curiosity and a sense of wonder, although most will teach that from a creationist viewpoint rather than an evolutionary one. There is some overlap in Charlotte Mason and classical schooling, especially in the upper years; but there are also differences in methods and viewpoint. CM is not unschooling, although it uses some informal teaching methods and does encourage a fair amount of free time, especially outdoors. It's not a back-to-basics approach, although the basics are not neglected, just taught in different ways. And it's not a unit study method, although history and literature studies are combined. A CM schedule would feature short lessons (10 to 20 minutes per subject for the younger children, but longer for older ones) with an emphasis on excellent execution and focused attention, whether that is in thinking through a challenging math problem, looking carefully at a painting and then describing it, copying just a few words neatly, or listening to a short Bible episode and telling it back. Habit training is emphasized from a young age; children are taught the meaning of the CM school motto "I Am, I Can, I Ought, I Will." There are no gold stars or prizes, and competition with others is discouraged; each child is simply encouraged to do his best in everything. 1. Narration, which consists of the child telling back a story.This takes the place of composition in the early years. 2. Copywork, or the transcribing of a well-written piece of literature as handwriting practice. 3. Nature study with an emphasis on close, focused observation of creation as a means to knowledge of God. 4. Outdoor life is necessary to teach nature first-hand, which means plenty of time spent out of doors each day in all weather and in different environments for students of all ages. "School" for children younger than six consisted almost entirely of time spent outdoors. 5. Habit training as a discipline of the child's will and behavior. Children are trained to develop the will, which is manifested in a strong resolve to act in a right manner. 6. Living Books rather than textbooks to convey ideas. Living books, whether fiction or non-fiction, are more than just interesting books that make a topic come alive. A true Living Book has the best material, from the best minds, or at least the real story from someone who was there or has a real interest in their subject.There is a high standard in literary excellence and, while she advocated the use of many books, quality is to be preferred over quantity. 7. First-hand exposure to great and noble ideas through books in each school subject, rather than rote memorization of dry facts. Besides books, children are exposed to great minds through art, music and poetry, which was read to the child daily. 8. Memorization was used, not to assimilate facts, but as a means to have material to meditate on, so her students memorized scripture and poetry. 9. History is taught with primary sources and well-written history books. 10. Literature is taught along with history. For example, if one is studing the Civil War, one would at the same time read works of American literature written at that time. 11. Once children are able to read fluently, they read the lessons themselves, except for books that need editing like Plutarch's Lives. 12. Reading instruction was primarily based on sight vocabulary, but did include use and teaching of phonics. Even beginning readers, she thought, ought to have something interesting to read, like nursery rhymes, rather than dull first readers, so she taught the sight words necessary to allow them to read real books. 13. Schooling is teacher-directed, not child-led, though the child can pursue any number of personal interests during their free time (and her students had all afternoon free. 14. Short lessons with an emphasis on excellent execution and focused attention and variation in the day's scheduled activities so as not to over-stress the brain on one task. 15. In the teaching of mathematics, the ability to reason is emphasized over "working sums", so emphasis is placed on story problems and working with numbers that are within the child's comprehension, therefore, a manipulative-based instruction is desirable. 16. CM encouraged proficiency in at least one other language, specifically French, as well as study in Latin. 17. Charlotte Mason set aside time each day for some form of physical fitness routine which included daily walks and a "drill" which included stretching, breathing exercises, calisthenics, dancing, singing, and games. 18. The knowledge of God, as found in the Bible, is the primary knowledge and the most important. Charlotte Mason boiled down her ideals for children's education into 20 Principles, which are found in the prefaces to her books, or in a simplified version here. A "CM education" is one that attempts to follow her principles. Charlotte Mason also created a "List of Attainments;" what a child should be able to do by age 6, and by age 12. Question: "I use Living Books, we go on nature walks and I have my children narrate--aren't I pretty much already doing a Charlotte Mason education?" The Charlotte Mason method is more than these elements. It's more than a curriculum. In fact, knowing what Charlotte said, agreeing that it makes sense, and doing it 'more or less' is not a really Charlotte Mason education, and won't get the kind of results seen in her students. A Charlotte Mason education is one that fully attempts to follow her 20 Principles as detailed in her books. Charlotte Mason wrote in Volume 6 page 19: "The reader will say with truth,--'I knew all this before and have always acted more or less on these principles'; and I can only point to the unusual results we obtain through adhering, not 'more or less,' but strictly to the principles and practices I have indicated. I suppose the difficulties are of the sort that Lister had to contend with; every surgeon knew that his instruments and appurtenances should be kept clean, but the saving of millions of lives has resulted from the adoption of the great surgeon's antiseptic treatment; that is, from the substitution of exact principles scrupulously applied, for the rather casual 'more or less' methods of earlier days." I realize this may be controversial, but I'm also becoming more and more convinced that Charlotte Mason's philosophy and methods are so firmly rooted in the Christian view of a personal God, the created world, and people (as individuals created in God's image) that they must work because they are true, because they fit the way the world works from a Biblical viewpoint. This is still allowing for the differences in some of her religious and scientific beliefs and her excessive optimism about mankind's future progress through education--and you know, maybe she wasn't so far off the mark with that last one, because her idea of education...as in, education is a life...wasn't the same idea people usually have when they say all we need is more education. And, because the philosophy makes more sense as I understand more of it, the methods seem to work better and make more sense, too. 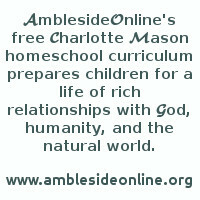 I'm not saying that Christians shouldn't use other kinds of homeschool methods or curriculum (if God guides them in another direction), or even that non-Christians can't use Charlotte Mason methods. (I think one of Charlotte Mason's closest friends was Jewish.) Just that the more I learn about the "why" of this, the closer it seems to run in parallel with a Christian understanding of who we are in God's world. Short lessons--I thought it best to keep going until we tired of a subject. But my kids are fresher and stay interested longer with short lessons--they have better retention, too. Slowly reading through a book a few pages at a time instead of sitting down for a gluttonous feast of cover to cover reading (it's oh-so-fun that way!) --I thought it was ridiculous to make a child quit reading a school book if she was having fun with it. But I find that when I slow my children down with their schoolbooks, they think about the material longer, harder, and deeper. They remember details better, as well. Unit studies--Charlotte Mason really did not much care for most unit studies. She has some very amusing things to say about them. I was using a unit study curriculum when I first read the six volume series, and I thought she was mistaken. But the fewer unit study projects I do, the more real learning my kids do, the more time I have, the less mess there is to pick up! Miss Mason talks about letting the kids make their own connections. The more I step back and let this happen, the more amazed I am at how many connections the kids make that I never thought of. Dictation--I never did prepared dictation in a steady, organized fashion until around 2003. Since implementing it. I've seen big improvements in my girls' spelling and writing skills. Drawing--I thought drawing was something you either could do or you could not do--not a skill that could be taught. I tried some easy teaching programs, and found that the children who had the benefit of those programs did draw better than those who did not. They are not artists, and I didn't stick to the programs as much as I should have, but there is definitely a difference. Narration on every single reading--this is so important! I see much better retention, better interaction with the book, greater interest in the story, improved language skills, and better understanding of the material. For more about what CM is, and what it isn't, see our FAQ.